Probably not as many as you think. Maybe not as much as you think. Students occasionally ask me “How many calories do you burn practicing yoga?” I often assume that what’s underlying the question is another question, “Will I lose weight practicing yoga?” but that’s really a different question, which I’ll touch on later. But because the word “calorie” is so bound up with the issue of weight loss, I think it’s useful to reframe the question as: “How much energy do you expend practicing yoga?” Actually, that’s all a calorie is—a measure of energy. That question can help us answer another one: “Does yoga qualify as aerobic exercise?” Or, more precisely, is it intense enough to stimulate improved cardiorespiratory fitness? Caloric expenditure can be measured directly. In the 1780s the French chemist Antoine de Lavoisier was the first to do so, placing a guinea pig in a container surrounded by ice. By measuring how much ice melted, Lavoisier was able to determine how much heat the poor little fellow generated. Methods have evolved since then, but direct calorimetry is still cumbersome, especially if you want to measure something as big and complex as a human being practicing yoga asanas. Instead, researchers often use indirect calorimetry—measuring a subject’s oxygen intake and carbon dioxide output to determine energy expenditure. Since we take in oxygen to metabolize nutrients for energy, this works as well as directly measuring calories. The subject typically breathes through a mask connected by a hose to a metabolic cart, although there are also room-sized calorimeters that don’t require masks. Since it’s possible the encumbrance of a mask could alter a person’s practice and affect energy expenditure, theoretically a room calorimeter might be more accurate. In practice, this doesn’t seem to be the case; studies using either method yield pretty similar results. In any case, I’ll start by looking at a study that used a room calorimeter, at St. Lukes’-Roosevelt Hospital in New York. Hagins et al tested 20 subjects (18 women and two men), all with at least a year of yoga experience. After a 30 minute rest period to establish baseline values, the practitioners followed a 56 minute beginner ashtanga video that included 28 minutes of sun salutations, 20 minutes of standing poses, and eight minutes of sitting in lotus and savasana. After savasana they walked on a treadmill first at 2 mph, then at 3 mph, for 10 minutes each. Their energy expenditure averaged 1.2 kilocalories per minute at rest, and 3.2 kilocalories per minute over the entire yoga session. (Technically, what we usually call “calories” are actually kilocalories, or kcal.) Walking at 2 mph used about 3.1 kcal per minute, or about the same as yoga practice. Not surprisingly, sun salutations were the most energy-intensive segment of the yoga session, averaging 3.7 kcal/min, although that was still well under the 4.2 kcal/min the subjects averaged walking at 3 mph. The bottom line? For the entire 56 minute practice, the average energy expenditure was about 180 calories—equivalent to walking at a moderate pace of about 2 mph. That’s something, but not particularly impressive as aerobic exercise. So, did the yoga practice meet recommendations for improving cardio-respiratory fitness? (This was actually the primary question the study’s authors wanted to answer.) Not really. OK, but what determines whether exercise is moderate or intense? Rather than specifying calorie expenditure, the ACSM frames its recommendations in METs, or metabolic equivalents. One MET is basically equivalent to your metabolic rate while sitting quietly, although since metabolic rates differ between people, a MET is typically standardized at one kcal per kilogram of body weight per hour. In other words, if you weigh 50 kilograms, or 110 pounds, one standard MET would represent a resting energy expenditure of 50 kcal per hour. The ACSM defines moderate exercise as exceeding three METs, or three times your resting metabolic rate, and intense exercise as greater than six METs. The yogis in this study averaged 2.5 METs over the entire practice, which falls short of the moderate level the ACSM recommends. However, it’s worth noting that sun salutations were more vigorous. Practitioners averaged 2.9 METs during the sun salutation portion, putting them close to the cut off for moderate exercise. Of course, any cut off figure like 3 METs is somewhat arbitrary. 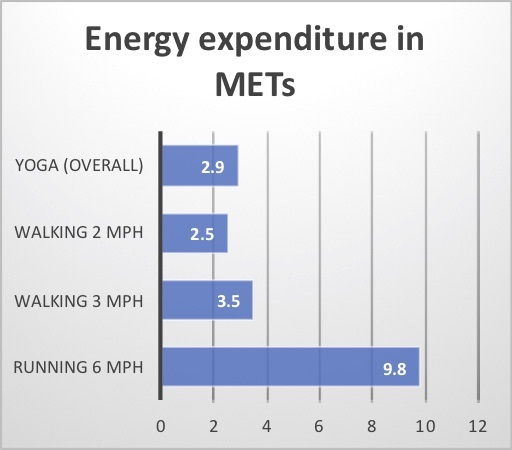 It’s not as if exercising at 2.9 METs has no value, and suddenly when you reach 3 METs, you start seeing benefits. But those numbers do represent the reality that exercise has to reach a certain level of intensity to trigger beneficial adaptations. If the stress to your body is too minimal, it won’t have any effect. Where that threshold lies depends on the individual. For someone who’s very out of shape, almost any increase in activity will stimulate positive changes. Someone who’s already in great shape will need more stimulus to see effects. So don’t get too hung up on the exact numbers. At the same time, they’re a useful guideline for most people. That’s just one study. How does it compare to other research? In another study by Clay et al, students in a university yoga class (28 women and two men) followed a 30 minute yoga routine on video and walked on a treadmill at 3.5 mph for comparison. The yoga practice included a five minute warm up, five minutes of sun salutations, another 15 minutes of standing, seated and floor poses, each held for 20 seconds, and a five minute cool-down including savasana. These numbers are fairly similar to those from the Hagins et al study. Once again, yoga was significantly less vigorous than brisk walking. The review examined 17 studies covering a wide range of yoga practices, from pranayama and seated postures to sun salutations and complete vinyasa classes. A few studies also tested energy consumption during specific poses. It’s worth noting that there was a wide range of quality between studies and that several of them were of fairly low quality. Overall, the review found that yoga practice averaged 3.3 METs. That number is skewed by one small study that measured energy consumption of 7.4 METs during sun salutations, which was well in excess of other studies. Eliminating that single outlier, yoga practice averaged 2.9 METs—in line with the previous two studies. Not surprisingly, studies that looked at pranayama found that energy expenditure wasn’t much higher than resting, averaging 1.3 to 1.5 METs. In terms of individual asanas, again not surprisingly, standing balances and backbends used the most energy, but overall energy expenditure was highest during sun salutations. Since the dynamic movements of sun salutations use more energy than static poses, you might wonder whether speeding up your practice would burn more calories. A couple of studies have addressed this question. The larger of the two (Potiaumpai et al) tested 22 experienced practitioners (15 women and five men) practicing eight minutes of surya namaskar B at a pace set by a metronome. The researchers compared practicing at a speed of three seconds per pose vs. 12 seconds per pose. Not surprisingly, energy consumption was significantly higher during faster paced sun salutations than during the slow version (5.42 kcal/min vs. 3.30 kcal/min). A smaller study by Joshua and Dunbar of four experienced practitioners (two women and two men) measured energy expenditure during a 30 minute practice of surya namaskar B at a pace of 45 seconds per round—a pretty quick tempo. The women averaged 5-7 METs during the practice. The men used a little more energy, averaging 7-8.6 METs. This was a small study, so it’s wise not to extrapolate too much, but those figures are well within the range of moderate to vigorous exercise, so practicing fast sun salutations may meet the ACSM guidelines. But, overall, yoga doesn’t appear to be a particularly vigorous form of cardio-respiratory exercise. First, even at lower intensities, yoga still offers plenty of benefits for your cardiovascular system, although they appear to stem more from modulating your body’s stress response than from directly training cardiovascular fitness. Plus, it’s only an issue if yoga is your sole form of exercise. If you’re a runner or biker or swimmer, you’re likely getting plenty of aerobic exercise. Even if you just walk a lot, as long as you walk briskly, you’re getting some moderate cardiorespiratory stimulus, although it’s probably wise to also add occasional higher intensity workouts to your routine. There’s growing evidence that the higher the intensity, the greater the cardiovascular benefits (up to a point). Of course, if don’t do any exercise other than yoga, it’s more of a concern. You could try to up the intensity level of your yoga practice by doing lots of fast sun salutations. But if that’s all you do, you run the risk of repetitive stress and diminishing returns. Better, in my opinion, to vary your movement diet. This leads us to one of the fundamental principles of exercise science: specificity. Exercise works through the SAID principle—specific adaptation to imposed demand. Whatever you practice, that’s what your body gets better at. Why would we expect yoga to have the same effects as high intensity conditioning? It has its own unique benefits, as does every form of exercise. If your goal is overall health, there’s no reason why you have to limit yourself to one thing. On the other hand, the best form of exercise is the one you’ll actually do. If running or HIIT classes make you miserable, you won’t stick with them. Find something you enjoy. And if that’s yoga and nothing else, you’re still getting more exercise than most people do. What about if you want to lose weight? Will you burn enough calories with yoga? First, diet is much more important than exercise for weight loss. The research is clear that exercising without changing your diet yields only minimal results. Even at high intensity, it takes many hours of exercise to create enough of a calorie deficit to lose a pound of fat. Low intensity exercise like yoga would require even more volume—so much that the calories you expend during yoga probably won’t make a huge difference. However, there’s some research that suggests that yoga is helpful for weight control anyway. Yoga helps you manage stress and fosters self-regulation and a more aware, mindful relationship with your body, all of which can lead to more healthy eating, regardless of how many calories you burn while practicing. In fact, the popular notion that the point of exercise is to burn calories to lose weight is really a misunderstanding of how exercise works. The benefit of any exercise is that it stimulates your body to make positive adaptations in response to the stress of exercising. If anything, it would be more accurate to say we burn calories in order to exercise, not the other way around. In terms of caloric expenditure, yoga is light to, possibly, moderate intensity. If you want to make it more intense, you can practice more sun salutations and challenging poses or speed it up, but ultimately you’re probably better off just adding other types of exercise into the mix. And instead of focusing on how many calories you’re burning, practice yoga because it helps you feel stronger or more mobile or more relaxed—or whatever the benefits you get from your practice. But why does yoga feel so difficult? One more thing: you may be asking yourself, “If yoga isn’t very intense, why does it feel so difficult?” It certainly feels harder than walking, right? Exercise physiologists use RPE, or rating of perceived exertion, to rate how difficult an exercise feels to the practitioner. The research on RPE and yoga is pretty limited, but it seems that practitioners tend to rate their practice as harder than you’d expect based on energy expenditure alone. Not only that, but yoga practice seems to elicit a higher heart rate response than you’d expect for the amount of energy used. Generally, heart rate is a pretty good indicator of exercise intensity and energy expenditure. Makes sense, because your heart has to pump all that oxygen to your muscles. But that relationship doesn’t seem so clear with yoga. I think there are some interesting physiological mechanisms that might be behind the mismatch between perception and reality of energy expenditure in yoga. But since there isn’t much research on the topic, it’s pretty speculative, so I’ll save that speculation for a later blog post. Stay tuned. Hagins M et al. Does practicing hatha yoga satisfy recommendations for intensity of physical activity which improves and maintains health and cardiovascular fitness? BMC Complement Altern Med. 2007 Nov 30;7:40. Garber CE et al. American College of Sports Medicine position stand. Quantity and quality of exercise for developing and maintaining cardiorespiratory, musculoskeletal, and neuromotor fitness in apparently healthy adults: guidance for prescribing exercise. Med Sci Sports Exerc. 2011 Jul;43(7):1334-59. Ainsworth BE et al. 2011 Compendium of Physical Activities: a second update of codes and MET values. Med Sci Sports Exerc. 2011 Aug;43(8):1575-81. Clay C et al. The Metabolic Cost of Hatha Yoga. J Strength Cond Res. 2005 Aug;19(3):604-10. Potiaumpai et al. Differences in energy expenditure during high-speed versus standard-speed yoga: A randomized sequence crossover trial. Complement Ther Med. 2016 Dec;29:169-174. Joshua S & Dunbar C. Cardiovascular and Metabolic Responses to Vinyasa Yoga and Paced Surya Namaskar B. J Yoga Phys Ther. 2016. 6:230. McIver S et al. Overeating is not about the food: women describe their experience of a yoga treatment program for binge eating. Qual Health Res. 2009 Sep;19(9):1234-45. Neumark-Sztainer D et al. How Is the Practice of Yoga Related to Weight Status? Population-Based Findings From Project EAT-IV. J Phys Act Health. 2017 Dec 1;14(12):905-912. ← Scapulohumeral rhythm: what happens when you lift your arms overhead? Very informative and well researched!